The Joys of a Reliable, All-Weather Baby Chick Brooder. One of the biggest challenges to keeping to flock of chickens is raising baby chicks successfully every time, especially when the weather doesn’t cooperate—and does it ever? What’s Wrong With Ordinary Chicken Brooders? The biggest single thing you can do to ensure successful with baby chicks is to build a chicken brooder that really does the job. What’s wrong with ordinary brooders? Overhead heat lamps are fragile, use a lot of electricity, and don’t keep the chicks as snug as you’d like. Sheet-metal brooders don’t work at all in unheated rooms unless you have a guaranteed run of warm weather. Propane brooders are available only for large-scale brooding. Since the poultry brooders on the market don’t get the job done, you need to build one yourself. One that keeps the chicks warm, is easy to build, and is insulated to save electricity. This design was developed by the Ohio Experiment Station in the Forties, and was once used on vast numbers of American farms, but was almost forgotten when I rediscovered them in the Nineties and popularized them again. My book, Success With Baby Chicks, (now available as both a paperback and a Kindle eBook), devotes two whole chapters to insulated electric lamp brooders, but I’ll give you the gist of it here. 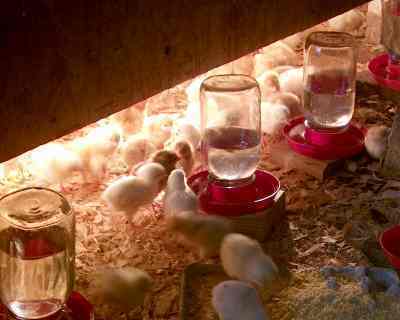 These brooders use light bulbs for heat: infrared heat lamps, floodlights, or ordinary light bulbs, depending on how big the brooder is and how cold it is outside. These brooders are very easy to build, the chicks love them, work great in any weather, and have a great reputation among those who use them. These baby chick brooders are built mostly from plywood and can be banged together by anyone who can drive a nail one time out of three. They use two lamps, which means your chicks will be okay even if one burns out. Thermostats are not used (and aren’t desirable) in this kind of brooder, so there are no controls to set. It’s all very simple and foolproof. Millions of chicks have been raised with brooders of this design. What follows is just a sampling of the information in my book, Success With Baby Chicks. Baby chicks need heat, but are very small, so only the heat at floor level matters. Radiant heat, such as from heat lamps, can keep a chick warm even if the air temperature is cold, but radiant heat alone is expensive. Heat lamps and reflector floodlight bulbs are the most convenient source of heat. Both types make good brooder lamps. Heat rises, so it tends to heat the ceiling rather than the floor. Trapping the heat with an insulated ceiling above the chicks (a “hover”) will save energy. Using a combination of radiant heat and an insulated hover will provide the best of both worlds, using one-third the electricity while keeping the chicks safer and more comfortable. Winter brooding is straightforward with this equipment. 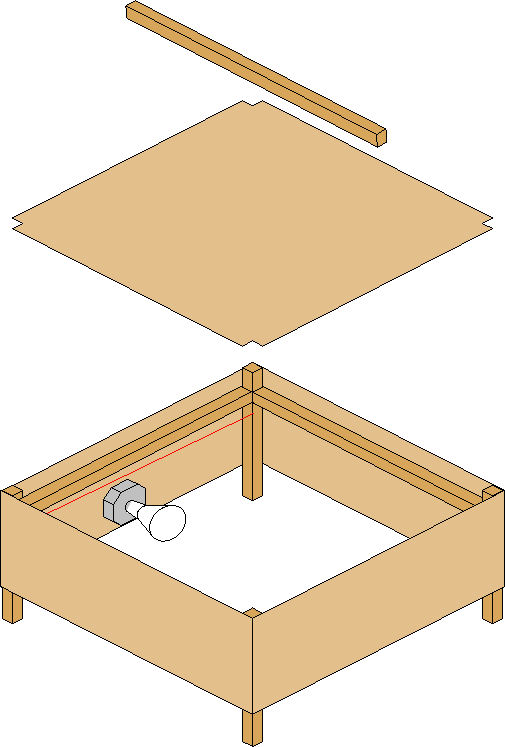 A lightweight plywood brooder box with two heat lamps can be built in a couple of hours and will last for years. 50 chicks for a 2×2-foot brooder. 100 chicks for a 2×4-foot brooder (my favorite size). 200 chicks for a 4×4-foot brooder. Use either heat lamps or reflector floodlamps. For above- freezing temperatures, use two bulbs of the size given below (for winter brooding, see Success With Baby Chicks). Use porcelain lamp sockets. Other types don’t last due to the heat. Use junction boxes rather than screwing the lamp sockets to the plywood. Don’t overload the circuit. Among other things, your chicks will become chilled if a circuit breaker flips. Don’t complicate things with thermostats or switches. These just add complexity and give you more ways to chill your chicks by setting things wrong. Plug in the lamps and leave them on. Turn on your brooder early. The floor under the brooder must be warm and dry to the touch before the baby chicks are added. At first, put your quart-jar waterers and first feeders so they are right at the edge of the brooder, so they’ll be lit up by the lamps. As the chicks grow, raising the brooder up on blocks will make it warm a larger floor area, eliminating the tendency for the chicks to try to crowd inside. The rule of thumb about “90 degrees under the brooder” doesn’t really apply to heat-lamp brooders. The comfort of the chicks, especially late at night or first thing in the morning, is your best guide. These box brooders are ideal for any kind of poultry: ducklings, goslings, turkey poults, and gamebirds like pheasant and quail. You can brood any kind of poultry in them as if you were brooding baby chicks. I’ve reproduced the original Ohio Experiment Station bulletin below. Requires no curtains during usual brooding conditions. In severely cold weather, curtains may be needed to conserve heat or prevent floor drafts; otherwise, curtains should not be used. Figure 1. A 4×4-foot hover. Note 4-inch space on top for insulation material. Electric lamps have recently become available which offer new opportunities for brooding chicks and baby turkeys. These lamps are available in two types, 150-watt projector or reflector spot or flood lamps and 250-watt R-40 Bulb Drying Lamps [heat lamps], all of which project infrared or radiant heat rays, as well as light rays. The projector lamps [outdoor floodlights] are made of heavy glass and can be subjected to cold, rain, or snow when burning, whereas the less expensive reflector lamps [indoor floodlights], made of thin glass, are liable to crack if subjected to water while burning. The projector and reflector lamps have a life rating of 1,000 or more hours, and a longer life can be secured by using 120-volt lamps on a 110- to 115-volt circuit. The 120-volt lamps generally serve for two brooding periods. The 250-watt R-40 Bulb Drying Lamps [heat lamps] have a much longer life rating, 5,000 or more hours. Figure 2. Some of the chicks take to the top of the hover. The satisfactory use of such lamps for converting batteries without heating elements into battery brooders suggested using them for floor brooders. In both types of brooders, the lamps were placed in a horizontal position to project the heat and light across the hover rather than downward. 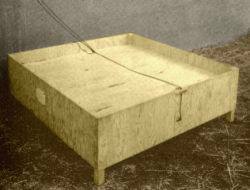 The floor brooding hovers designed and used extensively by the Ohio Agricultural Experiment Station are simple, inexpensive, and easily made of plywood or pressed wood. 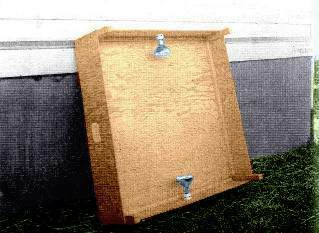 The sides are 12 inches wide and extend four inches above the top to provide ample space of the fine litter-insulation material (fig. 1). Desirable insulation materials are finely ground corncobs, shavings, sawdust, or fine peat moss. With this type of hover, unlike most, the chicks are encouraged to roost on top of the brooder. After the first 2 weeks, they take to the top during the daytime and thus leave more room for those remaining on the floor (fig. 2). Inside of a 4×4-foot hover equipped with two lamps. The bottom edge of the hover is 4 inches above the floor. Side curtains can be used when needed during severely cold weather. If there are floor drafts, a curtain can be used on the one or two exposed sides. The hover may be made 4 by 4 feet for 200 to 250 chicks or 4 by 6 feet for 250 to 300 chicks. The lamps are placed in a horizontal position in the center of opposite sides of the 4 by 4-foot hover or in the center of the ends of the 4 by 6-foot hover so that the center of the porcelain lamp socket is 3 inches above the bottom edge of the hover (fig. 3). No special provision need be made for ventilation. That which takes place through the open space between the lower edge of the hover and the floor will be ample. As the chicks or poults grow larger and need more air and less heat, bricks or blocks can be placed under the legs to raise the hover 2, 4, or 6 inches higher. When feed and water are to be placed under the hover, or the floor litter is to be removed, one side can be raised to the desired height and held in place by a hook suspended from the ceiling of the brooder house. This type of brooder with the abundance of light within makes it convenient to feed and water the chicks or poults under the hover during the first day or two; after that, the feed and water can be moved outside. The abundance of light beneath the hover and the feeding of baby turkeys under the hover during the first few days have proved especially advantageous for starting poults. Figure 4. Chicks under the brooder at night. No thermostatic regulation of the temperature is needed, since the chicks readily adapt themselves to their own temperature requirements and comfort in a brooder of this kind. Whenever it is observed that a considerable number of the chicks find it comfortable at the edge of, or outside, the brooder, the hover should be raised 2 to 4 inches to admit more air and to lower the temperature beneath it. If two lamps are in use, one can be turned off. The curtains used at the Experiment Station when needed to prevent floor drafts or to conserve heat under the hover during cold weather are strips of cloth 8 inches wide and 4 feet long made from feed bags. The strips are attached to the sides of the hover with thumbtacks so that the bottom of the curtain is ½ to 1 inch above the floor litter. The bottom of the curtain should be hemmed but need not be slit. When the hover was used in a room provided with another source of heat so the temperature seldom went below 40 F, curtains were not needed unless there was evidence of a floor draft which caused the chicks to congregate at one side of the hover. When that occurred, a curtain was attached to the exposed side or sides opposite those where the chicks congregated. A curtain on one or two of the exposed sides gave effective protection against floor drafts. When day-old chicks were started in an uninsulated colony house during cold weather (10 to 20 F.) in January 1941, it was necessary to use curtains on three sides of the hover during the first week to conserve the heat under the hover. Afterwards, two of the curtains were removed; one was left to prevent floor drafts. Also, a corrugated cardboard band 12 inches wide was used to keep the chicks within 1 to 2 feet of the hover during the first few days. Feed and water were provided under the hover during the first 2 or 3 days. In usual practice under average brooding conditions during April or May or in a room where supplementary heat is provided, the 250-watt lamp would generally be used during the first week or 10 days of the average 6-week brooding time, when the chicks or poults need the most heat. After that time, the 250-watt lamp would generally be discontinued, and the 150-watt lamp used for the rest of the brooding period. On this basis, the cost of operating the 250-watt lamp 10 days (at 18 cents a day of 24 hours with electric current at 3 cents a K.W.H.) would be $1.80, and that for the 150-watt lamp (at 10.8 cents a day for 32 days), $3.45. The total cost of electricity during a 6-week brooding period would, then, be $5.25. In warm weather, the cost of the electricity would be lower, since the brooder lamp would either be turned off, or one of the brooder lamps replaced by an ordinary 15-, 25-, or 50-watt Mazda light bulb to provide an attraction light and a small amount of heat during warm days or nights. Likewise, the small Mazda bulbs could be used during the latter part of the brooding period, when an attraction light and only a little heat are needed. On the other hand, brooding during cold weather in a cold room with both lamps in use much of the time would cost correspondingly more, just as the cost of brooding during cold weather is greater regardless of the source of heat. The effective insulation against heat loss which this type of hover provides can, however, be expected to prove economical in the use of electricity regardless of the kind of electrical heating element employed. In two of the tests, meter readings were made to secure the electric current requirement of the lamp brooder in comparison with a conventional brooder equipped with thermostatic heat regulation, fan, and special ventilation. 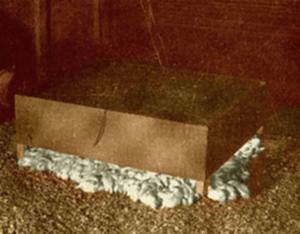 The first test was conducted in uninsulated colony brooder houses during January and February, 1941, and the second, in adjoining brooder pens during April and May. In both cases, the electric current consumption was somewhat less for the lamp brooder. The principal advantages of the electric brooder described are simplicity, low first cost, and effective insulation at practically no cost. Some poultrymen may be inclined to add needless complications and expense, such as thermostatic heat regulation, special ventilation, or other nonessential items or gadgets which would tend to offset the primary advantages and purpose of this type of brooder. The contention that such additions are needless is based upon the results of a year of almost continuous use of five of the brooders at the Station’s Poultry Plant. Hundreds of chicks have been brooded at all times of the year under widely varying conditions. In all instances, satisfactory results were secured with these simple, inexpensive brooders. At no time was there noticeable evidence of a need for thermostatic heat regulation, additional ventilation, or other items that would make these brooders more complicated and expensive. Read my book, Success With Baby Chicks. Want more poultry books? I publish a number of poultry books under my Norton Creek Press label. Most of these were written 50 or more years ago, before the shift to factory farming and the decline of the family farm caused serious poultry books to no longer be published, except for a few textbooks aimed at graduate students. James, thanks for writing! The patent thing is a side effect of two converging forces in Silicon Valley startups: (1) being willing to write up and extend other people’s ideas, and (2) being heavily involved in the blue-sky end of new-product development, where coming up with both new ideas and new wrinkles on old ideas are both everyday activities. I’d have no patents at all if I had to pay for them out of my own pocket. I’d have fewer except that, when I was at one company, we were making a joint-development deal with another company, one where all intellectual property that wasn’t specifically claimed in advance would be considered to be “jointly developed,” which would give away stuff we wanted for ourselves if we didn’t get busy. This meant we went into a frenzy of filing our entire backlog of patentable ideas. Normally we’d procrastinate and then only file the most urgent concepts, so this resulted in more patents being filed that we’d have done otherwise. Getting a patent doesn’t require a world-shaking idea, it’s mostly time-consuming, and the process is a bit strange. Hi. I have seen this brooder being used successfully for day-old chicks. I was thinking of trying the same thing for brooding quails. I wondered if you had any thoughts on that? Thanks! Hi Charlotte, funny you mention Quail above. I am here for same reason and have self designed a heated brooder in my head. I am here to learn and modify for my purposes. I have 1000 hatching Bobwhite chicks on the way and I am scurrying to accommodate. So far, my plan is to build more of a 3 sided box with a slanted long roof on one side and hinge that. And on the other “roof” side I will have a flat surface that I plan to cut out holes for my lamps to decsend into. I plan on two high end heat lamps from Premier1 Supplies as I believe them To be safest. Mine will provide heat coverage on a side of an 8′ by 11′ rectangular pen. That being a box around 2′ high by 8′ long and 3′ deep. The hinged roof is for access and to raise to lessen the heat if needed – I’m in Texas. This nursery is in my non insulated barn and fire safety is paramount to me as I am using heat lamps and am away during days at a time. I will insulate all interior surfaces with the reflective foam board. I will also raise bottom corners on blocks after a while as they grow and weather the temps. I ca continue to raise up to any height. The lamps will be tethered from ceiling and secured. I may have a higher than 2 foot ceiling. That is what I am figuring out. The lights are large and inclined in hard plastic do I have to accommodate for this size. Maybe roof will be 4 feet high. This layout gives me about 24 square feet of heated space for 1000 chicks. I am behind the gum so I have to construct a replica of this set up as I think the whole area is too small for amount of birds by half. The best heat source I have, and love, is a Sweeter Heater. (just Google it) All heat, no light, wide area of gentle, consistent heat, water and stupid proof. No fire hazard and seems to last forever. No thermostat, just keep it just above the chicks back as they from by adjusting the suspension chain. There are other little Mickey- Duck imported models but stick to American Made Sweeter Heaters. Sweeter Heaters appear to be expensive but in the long run the original cost is recovered by length of service, ease of use, economy of power usage, to say nothing about the cost of replacing a burned-down brooder house and increased insurance cost. For the DIYers one can buy something called Flex Watt (I think that is what is in a Sweeter Heater) – a plastic film with wires imbedded in it, available in various widths from reptile supply houses. .Just tack a length of it to the underside of the brooder – no light only heat and no thermostat. I have recently bought, but not yet tried, a heavy- duty heated rubber mat – intended for use by workers that spend their working days on cold concrete floors. It should be effective and is certainly indestructible and cheaper than Sweeter Heaters, though not as pretty.. I built a couple of these brooders and didn’t have time to install the electric light fixtures so I just used clamp on lights I already had. I used 75w and 100w bulbs. Having grown up raising 3000 chicks at a time I found this was great because the chicks didn’t pile up when they got cold. Getting cold under the brooder seamed to never happen. I checked the temperature by placing my hand under on the floor where the chicks would sleep. If it was warm and comfortable without my hand feeling sunburned then I knew it was just right The chicks looked like they had been running when they fell asleep and were all scattered with space between all of them. The only things I want to do different is put a piece of plexiglass in one end or 1/2 of the top covered in plexiglass so I can see them and not have to get on my hands and knees to look under the brooder. The last is to install the light fixtures. The clamped lamps gave me some concern they would fall off the boards they were clamped to. They didn’t, but, I would rather not be concerned about that. I appreciated getting the information many years ago when I had over 200 chicks and 35 ducks and 10 geese to brood. The ducks and geese were brooded in smaller boxes with the clamp lights on stands. They grew so fast and feathered quickly so they didn’t stay under the heat lights as long as the chickens. Thank you for having shared the info about 5 years ago. Thanks a lot for such great ideas.. Am a free range poultry keeper and I would like your advice on this…. Am planning to mix pigeons, ducks and chicken in the same house!! Are there any adverse effects on this move? Hello Robert, I purchased and read your book “Success with Baby Chicks” It is very informative and as I’ve never done broilers before I found this most helpful and what better way then to learn from the experience of others. I plan on making the insulated heat lamp brooder and the question which I had I don’t believe you answer in your book but I may also have missed that. Do I just put the food and water outside the lamp brooder ( but still inside the draft guard)? Won’t the light travel from underneath the heat lamp brooder and the chicks could still see the feeders and waterers? I like the idea of not having to remove their food every night and keeping their feeders with food in them at all times and having the room light on a timer to turn off for a period of time at night so they can’t eat at night but will sleep. But I just don’t understand how they will have darkness with the heat lamps on under the heat lamp brooder. I’ve never seen any sign that chicks suffer any ill effects from 24-hour light from the brooder lamps. Once night comes and the brooder house is dark except under the hover, they bed down and sleep. Lots of people will argue from theory and claim that light is bad. I argue from practice that I can’t tell the difference between red-lamp chicks and clear-lamp chicks. And it’s a lot easier to find clear bulbs in a variety of wattages. As far as I know, no breeds except hybrid broilers will overeat in 24-hour light, and in the first week of life, and especially the first few days, it’s all about ensuring that even the weaker and more confused chicks manage to eat ENOUGH. “Too much” is a concept that only comes in later, and then only for hybrid broilers. If you watch the chicks, you can see if it’s dim enough in the room for them to become inactive and bed down for the night. If they’re still running around after dark, the room is over-illuminated. They’ll bed down even if the light is bright enough for us to get around in the brooder house without bumping into things. Food placement: Putting feed and water under the brooder is for when it’s below freezing inside the brooder house. Otherwise, we start with the feeders and waterers just outside the brooder, where they’re easy to find and are well enough illuminated by the heat lamps. We gradually move the chick feeders and waterers away from the brooder. Hello, this was a really valuable article. I am just venturing into commercial poultry farming for the first time. I brought one hundred chicks 5 days ago for purposes of learning before I implement a bigger project of the same. I prepared a brooding section of 10 square feet for the 100 chicks as was recommended, unfortunately enough, I have had casualties, totaling to 20 chicks as of today. I am using a 75 watt normal incandescent bulb and I have noticed that the major problem is crowding at the center where the bulb is vertically hung. Chicks that succumbed have been trampled on in the event of seeking for warmth. I believe with this design of a brooding system, I am going to improve a great deal in reducing chick casualties. It was an article worth spending time reading. Gratitude. Thanks for writing! When the chicks pile into the center of the heated area, the thing to do is raise the lamp to make the heated area larger (though cooler). If you have anything like an adequate amount of heat, the chicks will spread out across the now-larger warm area, rather than fighting to get into the too-small hot area. But 75 watts isn’t a lot. In October, I’d be using 2-3 125-watt heat lamps if I were doing overhead heat-lamp brooding, and two 125-watt heat lamps with an insulated brooder. I would like to build a brooder box to leave out in a field, with the correct habitat around for Quail. I’m looking for a propane style heater for the box. any ideas where I can find this item? I’ve never left a brooder box out in the open, but have used some very poor sheds to shelter them. My biggest problem is that small birds tend to get gobbled up by random predators unless kept in a critter-proof house. I don’t know of any small propane systems, so I’ve always used extension cords. Could this design be used with 150-250 watt ceramic heating elements? I want to set up a brooder in my chicken tractor in the middle to end of April when the temps could go as low as the teens. I don’t see why not! I’ve often been tempted to try ceramic heating elements, since they seem sturdy and trouble-free. I’d be tempted to also use some kind of light bulb under the brooder, at least for the first three days, since baby chicks are attracted to light and this helps them come in out of the cold. After a few days they don’t need this hint anymore. 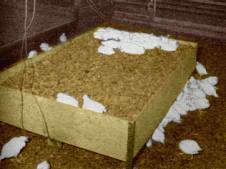 What number of turkey poults would you recommend per brooder size? I am raising hybrid meat chickens and they need to be inside until they have their mature feathers, in a few weeks. They then go to outside pens. I’m starting them in June as chicks, so it won’t be too cold in the barn. They will be much larger by the time they need to go outside. Do you think their 4 x 4 brooder will be large enough for 30? Hi, I want to build a brooder in an area with no access to electricity. I am using sonar panels, so I can’t have powerful heating lamp. What would you suggest ? Would a floodlamp of 10W be enough for 50 chicks ? Electric brooding isn’t very practical unless you have an abundance of 24/7 electricity. I’m not sure what to recommend as an alternative for 50 chicks — the right answer would be “a tiny propane brooder,” but I don’t think they exist. Not in the US, anyway. They all seem designed for hundreds and hundreds of chicks. In the old days, the use of kerosene lamp brooders and coal-stove brooders was so burdensome and erratic that everyone fell over themselves to abandon them for propane and electric brooders. So I wouldn’t recommend them. One thing that works pretty well is to do electric brooding for 2-3 weeks in some location where electricity is plentiful, then use an insulated brooder like the one I describe, but with no heat lamps. Older chicks can stay warm through body heat if the environment is favorable. But don’t brood chicks inside your house for more than about 48 hours. The smell and the dust quickly becomes indescribable!